Welcome to Big O’s Golf Carts! We are a family-owned and operated business who believes in living BIG! And we’ve been excited to meet so many of you who believe the same. After all, life’s too short to live ordinary. 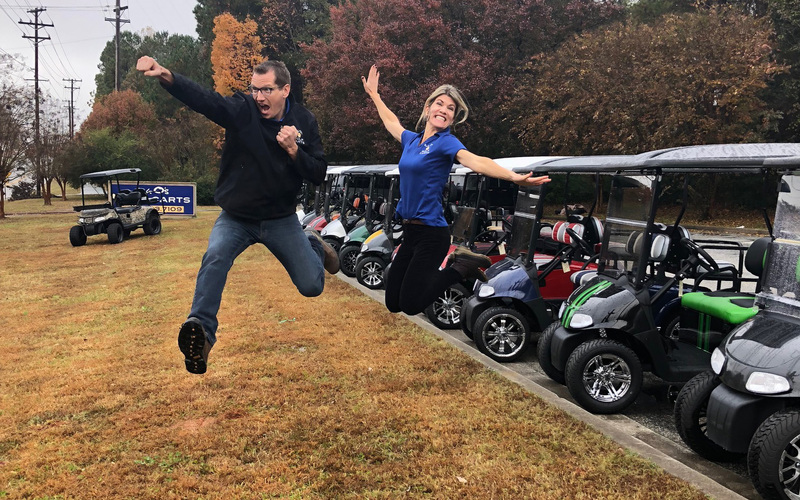 We strive relentlessly to create more than just great-performing and budget-friendly golf carts. We want to serve you well-beyond the golf cart paths. We want to inspire you to be YOU! Around here, we believe every person is made for greatness and being basic is for the birds. You aren’t “factory standard” so your golf cart shouldn’t be either. We want you to be confident to custom-build your life. To choose the roads (or golf cart paths) less traveled. To pursue your dreams. Our goal is to help you see bigger, believe bigger, and live BIGGER... in all areas of your life. Trust me when I say if we can do it, so can you! Pursuing dreams is what inspires our one-of-a-kind custom golf carts. We believe in creating a product that is made on purpose – and to serve a greater purpose. Inspiring entrepreneurs of this generation and the next, supporting community outreaches that are doing big things, and simply shaking the hands of new friends like you, fuels us to the core and keeps us up at night. Now that you know a little about us and our BIG vision, feel free to check out more of what we have to offer here. And we hope to see you in person soon!